This is a developing story. Read the live blog here. Thirty student activists from Cambridge Defend Education (CDE) have occupied Old Schools, which house the central University offices and office of the vice-chancellor. According to CDE, the occupation is “in support of staff striking to defend their pensions”. The group encouraged staff and students to stand outside Old Schools to demand “open access to the occupation and safety for occupiers”, and around 45 attended swiftly, but have now dispersed. CDE also claimed that security are “trying to remove students”, but the University has said this is “completely untrue”. 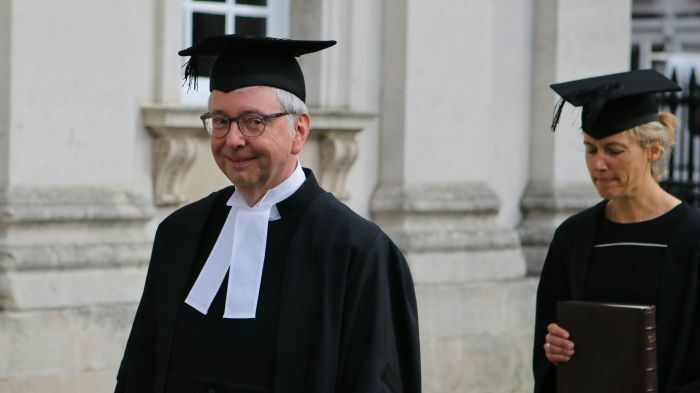 Only hours before the occupation, vice-chancellor Stephen Toope announced that the University would provide higher contributions to the pensions scheme which the strike is intended to maintain, though only while a long-term solution is found. Universities UK (UUK) also tonight announced that an agreement has been reached between UUK and the Universities and College Union (UCU). Both parties agreed to a transitional benefit arrangement which will maintain “a meaningful level” of defined benefits for scheme members and will last for three years. Both employers and members would have to pay higher contributions to make this possible, and the salary threshold would be reduced. UCU’s higher education committee and branch representatives will meet tomorrow to consider the proposal. During the occupation of Old Schools, which is ongoing, Cambridge Defend Education listed their demands in a Facebook post: “[We] Demand that the Vice Chancellor void the university’s response to the USS consultation in September 2017, and actively lobby UUK to maintain the USS Defined Benefit Scheme in the long term, with Cambridge as a member. “In line with Toope’s promises to being open and transparent, to hold an open meeting with students and staff to discuss the handling of the pension scheme, and further issues of institutional accountability and democracy. This should include transparency around the university’s investments, especially relating to staff pensions. A fire alarm was pulled in the neighbouring Gonville & Caius library at around 17:15. It is unclear who was responsible for the alarm sounding. The library reportedly reopened at around 18:00. At 18:30, senior pro-vice-chancellor, Duncan Maskell, entered Old Schools. At 18:52, Julie Taylor, a senior solicitor for the University, was also let inside the building. The gate to Senate House, next to Old Schools, has been locked. From the back entrance to Old Schools, students could be seen inside the building, putting up flyers. The occupation follows a failed attempt by students to storm the building on Thursday as part of a rally. During the rally, students and gown-clad academics gathered on Senate House lawn, chanting questions to vice-chancellor Stephen Toope. During that rally, protesters chanted questions to Toope, including: “Why is this university hiding behind the pension regulator?”.